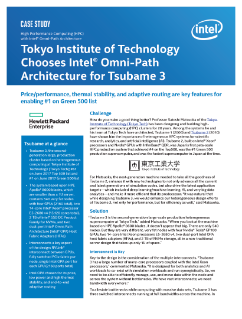 Tsubame 3 is the second-generation, large-scale production cluster at Tokyo Institute of Technology that is built on HPE Apollo 8600 blades with a heterogeneous computing architecture incorporating Nvidia GPUs, Intel® Xeon® processor E5-2680 v4, Intel® SSD DC Product Family NVME storage devices, and dual port Intel® OPA HFAs in a 1U chassis. It was designed to run co-located big data analytics and... machine learning/deep learning with simulation workloads. Three interconnect technologies in the system—NVLink for the GPUs, PCIe for the nodes, and Intel® OPA for the system fabric—enable large-scale machine learning and powerful simulation. Key to the Intel® Omni-Path Architecture selection was its price, low power and high thermal stability, and end-to-end adaptive routing capability.